Andy Murray says the Davis Cup final is "far from over" as he tries to win the competition for Great Britain against Belgium on Sunday. He can clinch the decisive third point against David Goffin that would end a 79-year wait for a British victory. Should Goffin prevail, the best-of-five tie will come down to a deciding match. Kyle Edmund is scheduled to meet Ruben Bemelmans, but James Ward and Steve Darcis remain options for captains Leon Smith and Johan van Herck in Ghent. Britain took a grip on the final when Andy and Jamie Murray beat Goffin and Darcis in Saturday's doubles. "I still think we have a very good chance in both of the matches tomorrow," said Andy Murray. "I'm not getting ahead of myself. I know how good a player Goffin is. You don't get to be ranked 15 in the world in today's game, with the depth that there is, if you're not pretty good." The weight of evidence makes Murray a strong favourite to complete the job on Sunday, and add the Davis Cup to the game's great prizes he has already won at Wimbledon, the US Open and Olympic Games. Murray, 28, has won both previous matches against Goffin in straight sets, at Wimbledon in 2014 and the Paris Masters earlier this month - that one a 6-1 6-0 drubbing. This third encounter will take place on the indoor clay of Flanders Expo, and with 90% of the crowd willing the Scot to lose. "I'm sure there will be nerves there, but I like being nervous," said Murray. "I think it helps me. It helps me concentrate. It helps me give a little bit more effort. It might only be a couple of percent, but it all makes a difference." Three weeks ago in Paris, Murray beat Goffin 6-1 6-0 in just 53 minutes. "I wasn't really there, mentally," the Belgian said, citing the need for a short break before the final. 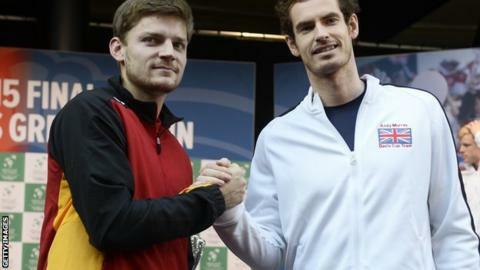 Despite a disastrous start against Kyle Edmund on Friday afternoon, those batteries appear to have been recharged - but Goffin still faces a mighty task to deprive Murray and Great Britain of the trophy. Britain's star turn has won all 10 of his Davis Cup matches this year: an 11th would seal a team triumph that seemed scarcely credible when GB faced relegation to the Davis Cup's fourth division just five years ago. Goffin, 24, has risen from outside the top 100 just 16 months ago to 16 in the world. He unexpectedly needed five sets to see off Edmund on Friday and then played four sets of doubles on Saturday, but insisted "physically, I'm feeling good". Goffin added: "I've never played against Andy on a clay court, so I'm going to try to play my best tennis. "Of course, I have nothing to lose. They lead 2-1 in the tie. I just have to give everything I have for the match. I think on a clay court I have some weapons to play a good match." Smith is within sight of guiding Britain to an historic Davis Cup victory, but remains focused on the task at hand. Ward and Edmund were out practising on court soon after the doubles ended on Saturday, and their captain said: "There's so much to be played - potentially two big matches. "But I would rather be having two shots rather than one." There is a very real possibility that Ward, who won a five-set thriller over American John Isner in the first round, would be called up for a deciding rubber. Van Herck has a similar dilemma, but Darcis declared himself available and the captain roused his players to make one last effort. "There's a huge task ahead of us," he said. "I think for every tennis player, it's a position he wants to be in. "We're going to show that we're a strong group, we're a strong team, and we're going to try to solve this together. We're all going to be ready to fight again. Anything can happen in Davis Cup."